I should have read this book years ago, really a great start to thinking differently and turning ones life around in a more proactive manner. Great Narration of the Audio book. It had me anticipating where I had left off each day. I'll be reading this again in the next couple of months. Stephen Covey is good ... but he is repackaging for you the work of Napoleon Hill. Most people find Covey easier to listen to than Hill, so give it a shot. But this book isn't so much about success in achieving big goals as it is about living a principled and balanced life. I enjoyed this book very much. I would definitely recommend this book to all my friends. To my disappointment, this was a single track - one CD book. While it does serve as a quick reference to the material in the book and gets its point across, I would have enjoyed a little more depth on the discussion. Like Cliffnotes, you miss the character and the deeper meaning without a build up of whys and hows. Worth a listen to those that want a quick overview, but I wish I had spent my checkout on something a bit more substantial. 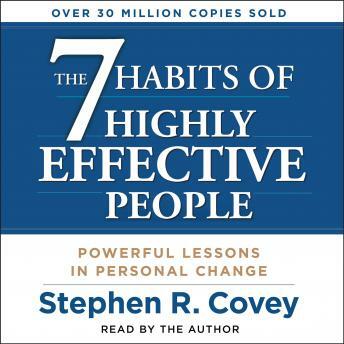 I am sure it is much better to attend one of Steven Covey's workshops than to listen to this abridged version. Between his voice (which is fluff and mushy) and the narrators, I was happy it was only one cd. Perhaps the entire book was better but this version is a cliffnote version only suited to those who want to brush up on material they already know. For those looking for motivation, look elsewhere. I can see how this was wildly successful a long time ago, because most of what you hear here is repeated in newer motivational material. As for the actual presentation of the CD, I found it very annoying to go from two different presenters. First, there is a professional reader that summarizes the material and then there is Stephen Covey himself (poorly recorded live) that throws in a story here and there. It goes back and forth like this throughout. Avoid.. Pretty good if your at the beginning of your personal development. Very good and easy to understand. It was an alright book but nothing miraculous. Simple points that are stretched out a little too much for me. I like the book because it advocates for being a healthy, well-balanced person who's first commitment is to his/her own integrity. It talks about how being effective first involves mastery of the self. After that has been attained, a person can successfully work with others. It also goes on to explain the need for constant growth and how everyone should make that apart of their daily life. I believe in the principles laid out in this book and find it a refreshing change from most books in the self-help genre.